Unser wunderschön eingerichtet, mit drei Schlafzimmern, drei Bädern, zweistöckige Villa in Estin der Northshore Nachbarschaft ist ein auf See den 15. Grün mit Blick auf die Choctawachee Bucht. e haben gerade ein großes Update der Villa abgeschlossen, sind neue Bäder, neue Farbe, neue Teppiche, neue Möbel, die erstaunlich gut geworden. Genießen Sie die spektakuläre Umgebung und den Komfort von zu Hause, darunter eine voll ausgestattete kithen, abgeschirmten Veranda, Gasgrill, Wi-Fi-Netzwerk mit Highspeed-Internet, Balkon im Obergeschoss mit Blick auf die Bucht, große, ruhige Gebiete zu gehen und zu spielen, und einfachen Zugang zu den Strand, Marina und Dorf. Mehrere Gäste haben gesagt, dass dies eines der schönsten Strand Reihenhäusern ist sie übernachtet haben. Sandestin Resort ist das erste Resort auf Floridas Smaragdküste. Genießen Sie die Herausforderung von vier deutlich unterschiedliche, Meisterschaft, Golfplätze und die Ruhe der Strand Nummer 1 in den USA nach USA Today Online. This was our first time in Destin and it was perfect! The condo was very clean and well maintained. The photos do it no justice. The location in Sandestin was perfect. We’ll definitely be back. A beautiful condo with everything you need for a wonderful vacation. The condo is wonderful. Very clean and well kept. Everything we needed was included in the condo. The family loved the golf cart provided. We were able to go to the beach with the cart and in the evening go to restaurants nearby on the property. All you need for a wonderful vacation when you are at this condo. If you have any questions and you text Bill he responds immediately. Certainly a great place for families. Thanks for sharing this beautiful condo. The condo was very nice - even nicer than it looks in the pictures. It was very clean and well stocked. The bathrooms looked brand new with no mildew in the showers. The golf cart was really fun to ride around the resort, to the beach or to the grocery store. We watched the fireworks from Baytowne Wharf from the upstairs balcony. The beach area was easy to get to. There’s a parking lot to park the golf cart and it’s a very short walk to the beach. Even during the busy summertime, there were always parking spaces available. Chair and umbrellas were available to rent on the beach (for a hefty price). It was hot in June, so we usually ended up buying some snow cones on the beach, too, which my kids love. The pool was very nice and never crowded. And the restaurant right by the the pool serves breakfast and lunch and is delicious. We went there twice. We also did a lot of cooking and the kitchen had everything we ever needed. The owner was very responsive and quickly answered the questions I had while I was there. Sandestin had everything we needed for a fabulous vacation, so we barely left the resort. And this condo was quiet, spacious, and beautiful. Thank you! We loved the beautiful view, access to the beach with the golf cart, and the house by itself was worth it all! The owner was very accommodating and fast to respond and to emails. We will definitely come back!! We didn’t want to leave! This condo is absolute perfection. 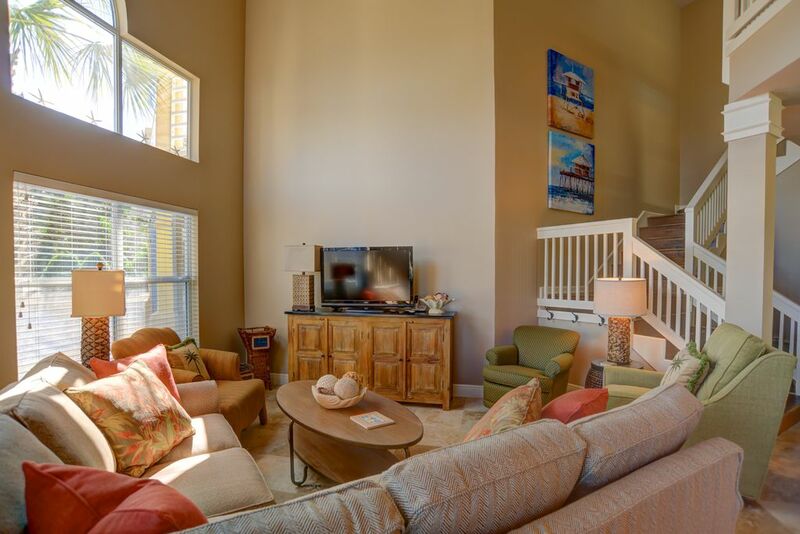 Sandestin has everything to offer as far as activities and amenities and this condo is in the heart of it all! This condo is laid out perfectly for any group of people whether family/ies or girls beach trip or guys golf week. Steps away from condo are beautiful walking/bike trails. The Pool/Gym/Restaurant overlooking the bay are steps away. A golf cart was included even to make getting to the beach a breeze!! Its right on the golf course with excellent view of the bay from the beautiful second floor deck. My favorite place was the screened porch right off the main living area. So peaceful and the best place to relax. I had the most amazing week here with a total recharge of my batteries after a busy few months. You will love it here and find peace as well as never run out of things to do in the resort or in the area. Book this condo - its a perfect 10! Das Hotel liegt in Sandestin, North Shore Viertel am See mit Blick auf die Links Course 15. Grün mit Blick auf die Choctawhatchee Bay. Schöne Aussicht und sehr ruhig. Genießen Sie die Palmen und Sonne über der Bucht. Praktisch für den Strand, Dorf am Baytowne Wharf, gute Restaurants, Einkaufsmöglichkeiten und eine Meile von der Silver Sands die größte Designer-Outlet-Einkaufszentrum des Landes.